Double or triple this recipe to serve more. Pour 2 teaspoons of the olive oil into the saucepan over medium heat. When the oil shimmers, add the shallot and ginger and cook, stirring occasionally, until the shallot starts to soften. Stir in the carrots and strained broth; bring to a boil, then reduce the heat to medium-low so that the liquid is simmering, cover, and cook until the carrots are very tender, about 15 minutes. Meanwhile, and when the beet is cool enough to handle, slip off its skin and cut it into 1/2-inch cubes. Toss in a small bowl with the rice vinegar, honey, and the remaining teaspoon of olive oil. 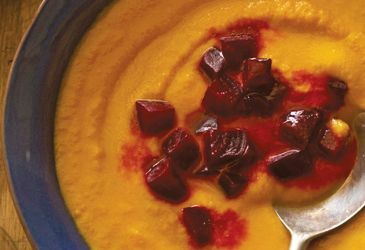 Use an immersion blender to puree the carrot mixture into a smooth soup, add salt to taste, and keep it warm until ready to eat. Alternatively, transfer to a blender and puree, removing the center knob in the blender’s lid and holding a dish towel over it to avoid splattering, and return it to the saucepan to warm. Add water to the soup if desired. Ladle the soup into a serving bowl, top with the beets and their liquid, and eat.